Good morning. 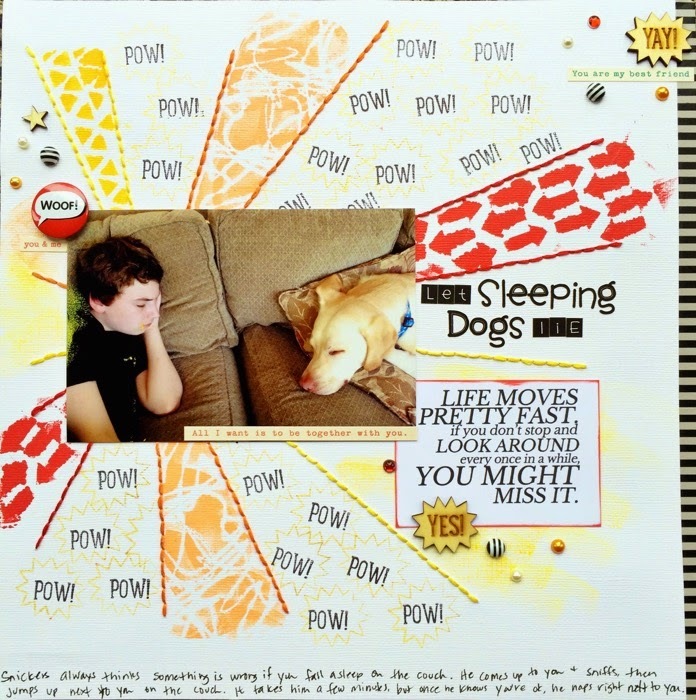 Today on the Get It Scrapped blog there is a new article talking about using Juxtaposition in scrapbook pages. I thought i would step outside my box on this one. My assignment was to create a page using juxtaposition in choice of product and technique. It was more challenging than I had anticipated. Once I figured it out, it was a breeze. After a lot of thought, I settled on this photo of mason and our dog sleeping. I love it because our dog laid down like he was worried, and needed to be near my son to make sure he was ok. The fact that they are face to face is what I love about the photo. I created juxtaposition, by creating and sticking a burst pattern on the page. The burst is energetic, the subjects in the photo are sleeping. I proceeded to fill in the arms of the burst by stamping ink over several bold patterned stencils. In between, I stamped a superhero speech bubble shape with an onomatopoeic saying over and over. Another energetic pattern. Lastly, I used a funny printable with a quote from the movie Ferris Bueller's Day Off. The printable is available in the Paper Issues shop. The embellishments are minimal due to the bold design of the page, but they all support the theme of the page.